Sister title The Sun is still taking financial hit from phone-hacking scandal. 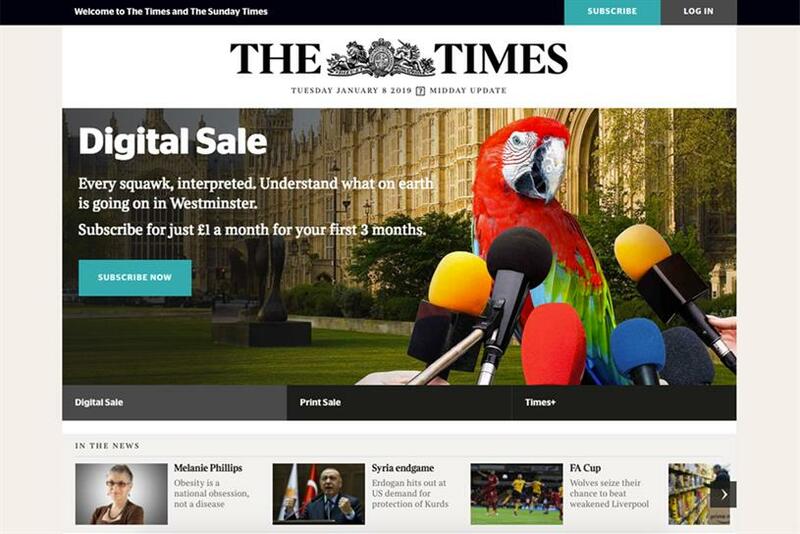 The Times and The Sunday Times increased revenues and profits last year as the online paywall and digital advertising growth more than offset the decline in print. Annual accounts at Companies House showed that Times Newspapers moved to a £9.6m pre-tax profit in 2018, compared with an £8m loss in 2017. The report stated that turnover was up 2% year on year to £326.4m, from £319.5m in 2017 – a significant milestone when other news publishers have seen little or no growth as revenues continue to shift to Google and Facebook. "The increase in turnover was underpinned by growth in digital subscription and digital advertising revenues which, supported by the impact of coverprice increases, more than offset continuing industry-wide declines in print volumes and print advertising," the accounts said. The Times and The Sunday Times grew their subscription audience by 12%, or 55,000 readers, to surpass the half-a-million mark to 502,000. The group said this was its second-biggest year of growth since it introduced the paywall in 2010, adding that it is the first time that the titles have more digital subscribers than print, with 51% being online. Rivals have followed The Times’ lead in reducing dependence on online advertising by driving reader revenues. The Daily Telegraph has introduced a paying premium service and reader registrations, while The Guardian has asked readers for voluntary contributions. Meanwhile, accounts for The Sun’s operating company, News Group Newspapers, reported the first advertising revenue growth in seven years. However, the continued fallout of the phone-hacking scandal, which forced the closure of News of the World in 2011, meant The Sun’s losses increased by 55% to £91.2m in 2018. The accounts said that £14.7m was paid in legal fees and damages for claimants, compared with £19.9m in the 2017 financial year. A further £30m charge was incurred for one-off costs "in regards to UK Newspaper matters", the majority of which was for legal fees. Last year, this cost was £27.4m. Turnover for The Sun was £401.4m, down 5.3% from £424m in 2017 because of "the continuing industry-wide decline in print newspaper circulation in the popular segment". However, it added that ad revenue was up for the first time in seven years, "with continuing declines in print more than offset by growth in digital advertising". This digital growth, The Sun said, was because of its "targeted digital investments", such as relaunching thesun.co.uk in 2016 and the roll-out of its mobile app in 2018.